I absolutely love breakfast foods; it’s my favorite meal of the day. I routinely eat breakfast for dinner. The main reason that the British Open is one of my favorite golf tournaments has nothing to do with the lush European courses, but rather has everything to do with the fact that my friends and I get up early (because of the time difference) and make an elaborate breakfast that we can enjoy while we’re watching the golfers. I am willing to get up for Black Friday shopping only if I am promised that we can go out for breakfast when we are done; I don’t care much about the deals, but I’m willing to suffer the crowds for some coffee and toast at a diner. 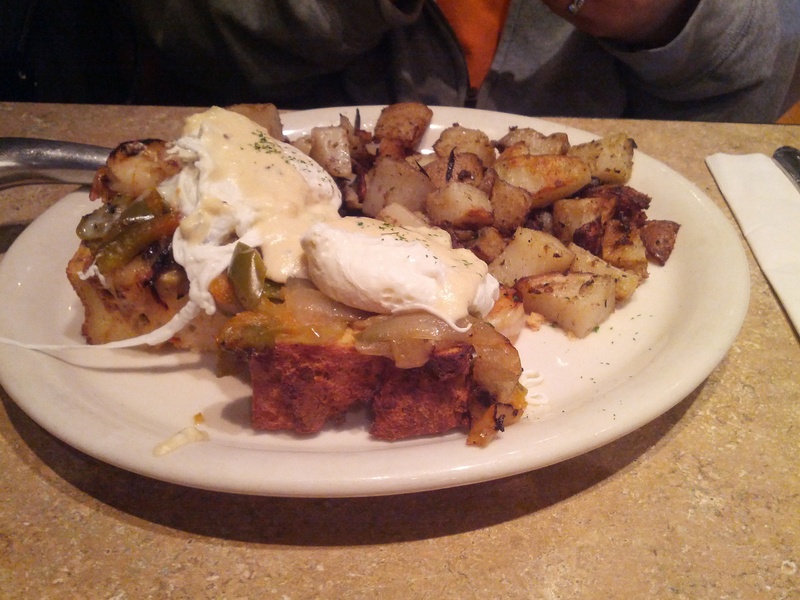 Omelets, French Toast and waffles – I just can’t get enough of them. Find me a place that makes good corned beef hash and I’ll be your friend for life (R.I.P, Miss Albany Diner. Your hash was amazing). The only real problem I have with breakfast is that it routinely happens so darn early in the morning and if you have spent any prolonged time with me, you would know that I am not a morning person by any stretch of the imagination. As much as I love breakfast, I love my sleep. The fact that I make it to my office by 8 am is no small feat, but that I do so when I routinely don’t get up until 7:10 am is a minor miracle. Co-workers know that expecting any real enthusiasm out of me before 10 am is pushing their luck and back in college my sorority sisters avoided waking me up before noon on the weekends. I’ll gladly get up early for sports and for a boy, but not much else. My love of breakfast yet my abhorrence of getting up early is solved with one perfectly crafted institution: brunch. Brunch is amazing because it is breakfast with a longer expiration date; while many places normally stop serving breakfast foods around 11 a.m., brunch leaves breakfast as an option well into the early afternoon. For a person like me that likes to sleep in, this is fantastic. Add in the fact that brunch also carries with it the social acceptability of drinking before noon – because what brunch is complete with a mimosa or a bloody mary – and in my mind, brunch is pretty much perfection. Going to brunch is pretty much one of my favorite things of all time; If I had my way, I would go out to brunch every single weekend if I could consistently get people to go with me. I’m fortunate that there are many great places for brunch nearby, but I almost always pick on particular restaurant over all the others. The Café Madison is my go to place and I love introducing it to other people. It is so good that I am actually willing to get up early to beat the rush; two weekends ago I set my alarm for 7:30 on a Sunday for their brunch. That, my friends, is love. Lannister Lion Frittata– Marinated and grilled buffalo style chicken, diced red onions, roasted red peppers, spinach and crispy bacon tossed inside our delicious and fluffy 4 egg frittata then topped with mozzarella and cheddar cheeses and baked to perfection. The Iron Throne Omelet– A deliciously light and simple omelet filled with fresh broccolini, diced red onion, diced tomatoes, mozzarella and parmesan cheeses then topped with a light balsamic reduction drizzle. Lady Stark Stuffed French Toast– Creamy mascarpone cheese infused with caramel, crushed peanuts, dark chocolate chunks, and miniature marshmallows stuffed between our homemade bread. It is then topped with graham cracker crumbles and a toasted marshmallow. The Night’s Watch– Three peanut butter pancakes dotted with Reese’s peanut butter cup chunks and bananas, then topped with a warm homemade chocolate sauce and crushed peanuts. Served with pure maple syrup. Wildlings Crepe– Delicious marinated and grilled lamb tossed with roasted carrots, grilled red onions, asparagus, and roasted potatoes then rolled inside a crepe shell with gorgonzola and topped with roasted garlic demi-glace. The White Walker – Creamy mascarpone infused with fresh pineapples, strawberries, and fresh squeezed and zested oranges rolled inside two crepes topped with a mango puree and fresh strawberry slices. Those are options that would make Robert Baratheon proud! 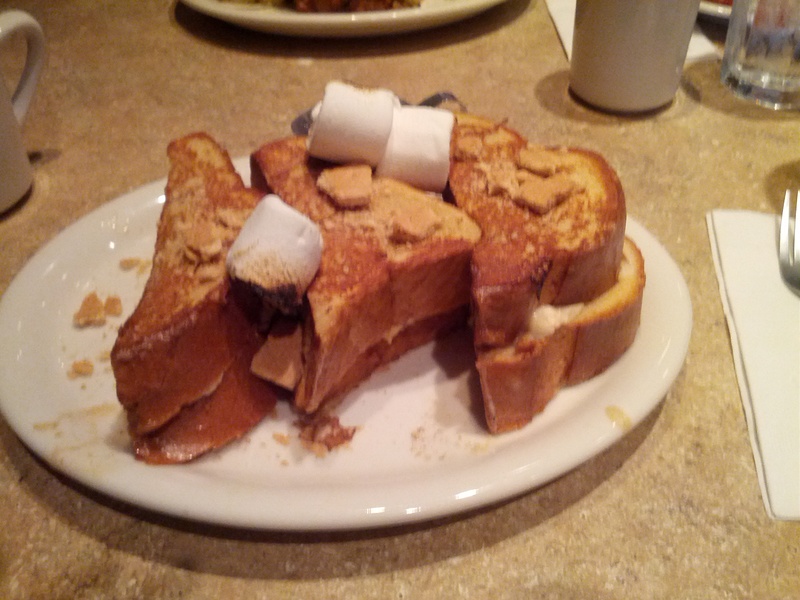 It was a tough decision, but ultimately I decided on Lady Stark Stuffed French Toast; she’s not my favorite character, but the idea of putting what sounds like French Toast and S ’mores together was just too much for me to resist. Not the healthiest way to start my day, but when was I likely to be faced with this amazing concoction again? They also make their own bread that I know is delicious, so while some of the other menu items were tempting, I had to go with Lady Stark (and a side of corned beef hash for good measure). Kristin decided on The King Slayer Benedict. That has intrigued me – I’ve never actually tried Eggs Benedict – but I feared it would be far too spicy for me, as I am a gigantic wimp. Even when I can’t get there for brunch, I always enjoy the pop culture specials; it’s amazing how much more tasty food can be when it has a fun name attached to it. And I can guarantee you that if they ever have a menu based on The Wire (“The McNulty” would have to include some ingredient soaked in liquor) or Arrested Development (special idea: “There’s Always Money in the Banana Stand” French Toast, made with banana bread), I’d be there even if I had to go alone. This entry was posted in Food and tagged brunch, Game of Thrones.